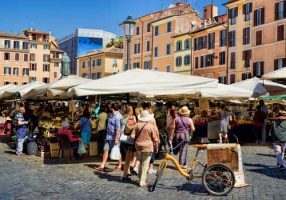 Just as Romans have done for thousands of years, they gather today in Campo de’ Fiori where visitors and locals alike find a beautiful open air market, offering everything from cut flowers to pizza. At night, the piazza transforms into a social hub for young people looking to make the most of the nightlife. Campo de’Fiori has spent the last 1,400 years transforming from a flower garden – the names translates to “Field of Flowers” – to a thriving market. Six days a week, the piazza is home to the only outdoor market in central Rome. Vendors sell everything from spice packets and limoncello – for the tourist crowd – to fresh vegetables, fruits, and even pomegranate juice.